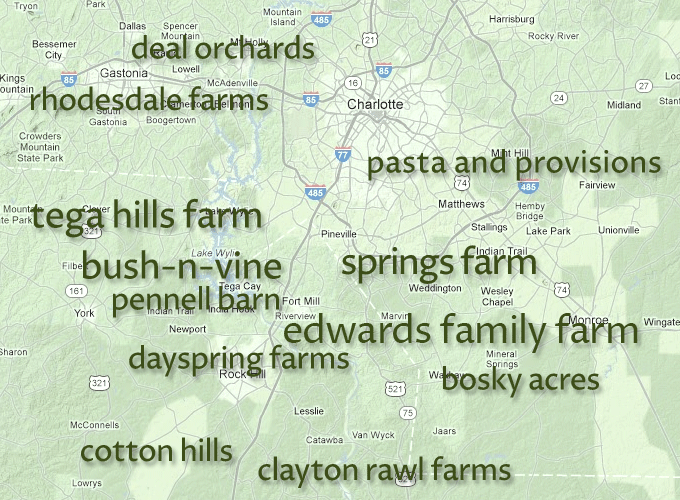 Fresh From the Farms is proud to work with area farmers to bring you the best quality produce. To view information about our farms, just click the pin next to the farm! Ever crave homemade fresh pasta, but have no idea where to go? Look no further than Pasta and Provisions, an Italian Food Market/Kitchen three miles south of uptown Charlotte. One visit to the 20–year–old market and you’ll enjoy the old Italian ambiance of creaking maple floors along with fresh–cut pasta whizzing overhead on a zip line, over racks of quality homemade and market fares. On the chalkboard, you’ll see P & P’s 14 different pasta varieties, sold by the pound, including Egg, Spinach, Garlic & Rosemary, Wild Mushroom and Arugula & Black Pepper. For the health–conscious, Pasta & Provisions also offers Whole Wheat and Organic Spelt pasta. Thirteen years ago, before Tega Hills owners Mindy and her husband Mark decided to make lettuce and microgreens their bread and butter, their focus was on tomatoes. But quickly they learned how customers’ tastes limited their tomatoes’ seasonal appeal to spring and summer. It’s been six years since Mindy has had to work as an English teacher at East Mecklenburg High School to help make ends meet. The dream her husband had to sell vegetables for a living is now reality, in the form of four huge greenhouses on their property just off Zoar Road in Tega Cay. Tega Hills has been a story of perseverance. In 2003, its first big break happened when a chef at Blu Restaurant in uptown Charlotte discovered their cutting edge microgreens. He immediately referred Tega Hills to four more upscale Charlotte restaurants: Barrington’s, Zebra, Bon Terra and Fig Tree. It took many years of part-time jobs and religious trips to serve faithful customers at the Matthews Farmers Market — even on weeks when they were closed — for Tega Hills to become a self-sustaining, thriving lettuce and microgreen powerhouse. You’ll find their offerings at 35 fine Charlotte-area restaurants, including Mimosa Grill, Zinc, Upstream and Fort Mill’s Passion 8 Bistro. Located in the rolling hills in southwest Union County, Bosky Acres makes fresh unripened goat cheese (Chevre) using the wonderful milk produced by the dairy goats raised on their farm near Waxhaw, N.C.
At the Bosky Acres farm, goats are raised in a healthy, hormone–free environment, including lots of fresh air and pasture to browse. The farm is licensed, regularly inspected and tested for clean, healthy milk. Bosky Acres also believes in holistic management, which they believe provides the best milk possible and also complements values of sustained practices. Bosky Acres goat cheese is used in recipes in some area fine restaurants, including Passion 8 Bistro in Fort Mill, Noble’s in Charlotte and Erin’s restaurant in Rock Hill. If you could ever ask an Asparagus, where its home is, Rhodesdale Farms may be the answer you get. For over 100 years, the Ware family build up their Cleveland County farm into a well–known market place for the Kings Mountain community – the type of place where customers were served with equal parts friendship along with quality produce. But recently, the Ware family decided to call it a day and Jason Rhodes has proudly taken over the operations. Don’t worry, the asparagus is just as good as ever. Not to mention the blueberries, peaches, strawberries all the way through the melons, tomatoes, nuts and jams. Open Mid–March through December, Rhodesdale Farm is located just off of Highway 74 business outside of Kings Mountain. You can also look them up at the Charlotte Farmers Market. You know it when you sink your teeth into it, that crisp taste, the juices dripping from the corners of your mouth. But where did that apple that your feasting on come from? Jesse Deal can tell you exactly where his apples come from: A 100-acre Deal family orchard 7.5 miles north of Taylorsville, N.C., on Highway 16. "Let’s face it, if you buy a cantaloupe from Honduras," Deal said, "how do you know what the cantaloupe’s been through by the time it gets to you?" Deal Orchard was started in 1939 by Brack and Thelma Deal and is now run by their son Lindsay at the foot of the Brushy Mountains. Less than 90 miles from Fort Mill, S.C., Deal Orchard is well-known for its super juicy Asian Pears as well as the dozen or so apple varieties, including Gala, Rome, Honey Crisp and Jesse’s personal favorite, Pink Lady. "I like the Pink Lady," Jesse said, his voice raising an octave. "Pink Ladies all year long." In a small town called Lowrys, S.C., some 25 miles southwest of Fort Mill, S.C., there’s a huge acreage of land known as Cotton Hills Farm. The 1,000 acres known as Cotton Hills Farm has been in the Wilson family since 1882, but now it’s Jeb Wilson, 31, his father (Jeff) and brother (Pete) running the show. And word about Cotton Hills is finally getting out to the "big cities" of Rock Hill and Fort Mill thanks to school field trips. "We’ve been doing (field trips) for the last 10 years now," Jeb said. "It really has helped identify what Cotton Hills Farms is." Jeff manages all aspects of the 400 acres of cotton as well as "a couple hundred" acres each of wheat and soy beans. Pete oversees the growing of produce, which include everything from strawberries to tomatoes to okra and 30 acres dedicated to each of their two staples – peaches and pumpkins. Jeb is in charge of the markets, including the new storefront wholesale building at Cotton Hills, along with selling produce at farmer’s markets, including Cramerton’s in Gastonia. Cotton Hills also provides Earthfare with produce. "I do enjoy working with customers," said Jeb, a master’s graduate in journalism from the University of Texas, who decided to come home and help build the family business. "Just seeing them enjoy what we’ve grown, knowing that it’s fresh and local. That we’re able to provide good local produce to Chester and York County." Want to know the difference between a free range, farm fresh egg and one at your local grocery store? Just ask John Gardner, who along with his wife Sandra, let their chickens roam free all day at their Dayspring Farms. The Gardner’s brown eggs carry a brighter yolk, which comes from their all-natural diet. “They eat grass,” he said. But stunning and delicious eggs are not the only delicacy Dayspring develops. Looking for local honey? Dayspring’s got you covered. And yes, the local stuff is worth the buzz. After growing up on a Montgomery, Ala., farm, John spent 44 years working at Winn-Dixie stores before retiring in 2002 and enrolling in Clemson bee school. If growing the ideal strawberry is truly an art form, Bush–N–Vine has spent years perfecting the "culture" of horticulture. Too much water? It’s gonna be mush. Not enough? Hard as a rock. Bob and Sam Hall at Bush–N–Vine in York, S.C., have long been working years, endlessly trying to perfect the brilliant ’berry. "There’s a fine line you have to walk sometimes," said Sam Hall, a 2010 Agriculture Economics graduate from Clemson. "You water it a little bit less, it sweetens it." "Seems simple, let’s cut off the water. Unfortunately, the plant still has to have water." But Sam and Bob, who started Bush–N–Vine 32 years ago before his senior year at Clemson, are not about to stop trying to perfect the process. What started as three weeks of harvesting has evolved into 28-30 weeks of strawberry harvest thanks to innovative techniques like drip irrigation and above–ground tunnels, implemented in 2005. "It’s a greenhouse without the heat," Sam explains the tunnels. "You have to get into the mind of a strawberry plant," Sam said. "You have to figure out what makes them tick." What makes Bush–N–Vine tick is not just Sam and Bob, but the extended Hall family, including Elizabeth, Heather, Benjamin, Susan, Ruth Anne, Mary and Lindsey, who all pitch in during the busy harvest season. And considering the variety of fruits and veggies – Bush–N–Vine grows everything from cabbage, spinach and summer squash to peaches, eggplant and sweet corn – there’s rarely a down season at the farm just off Highway 321. "We do almost anything and everything," Sam said. "If it can be grown." Very few words say Fort Mill more succinctly than The Peach Stand. Providing those stunning strawberries and perfect peaches you’ll find at The Peach Stand is Springs Farm, another household name, which has served Fort Mill since 1938. And behind Springs Farm is manager Ron Edwards, who eats, sleeps and breathes fresh local produce. "I love what I do every day," said Edwards, Springs Farms manager since 2004. "I was born and raised on a dairy farm. It’s all I’ve ever done." Edwards’ job is not for small-time thinkers. First, there’s the 22 acres of strawberries – 14,500 strawberry bushes per acre – all planted by hand. Then there’s 50 varieties of peaches over 70 acres. That’s 14,195 trees to manage if you’re keeping score at home. "Plus or minus 4 or 5 that the deer may have killed," Edwards said. In between, Springs Farm is a "7 day a week job" from April 15 to October 15, with blackberries, watermelon, tomatoes, cucumbers and all the other garden veggies that require harvesting. Yes providing fresh produce for The Peach Stand, Springs Farm Market (on Springfield Parkway) and the old Peach Stand (across from The Peach Stand from June 1 to Labor Day) is an all–consuming responsibility. But that’s what it takes. If you want to give your community the very best. "The only way to have fresh produce," Edwards said, "is to pick everyday." Newcomers to Fort Mill may hear it all the time. But Matt Edwards lived it out. "This used to be a fairly rural area," Matt said. "There weren’t a whole lot of options to buy stuff." The Edwards owned upwards of 500 acres of land between Fort Mill and the Steele Creek area of Charlotte, but as Matt explains with a slight somber tone, much of the land now consist of "a bunch of houses and shopping malls." But Matt and his dad, Richard, who grew up on a dairy farm before graduating with a horticulture degree from Clemson, still farm a few acres of land off Gold Hill Road. With a vast greenhouse, the Edwards grow everything from tomatoes and peppers to squash, cucumbers, okra and edamame. Three varieties of lettuce, spinach, cantaloupes, watermelon and peaches are just some of the varieties grown in the ground from seed. The teamwork between Matt and his dad keeps Edwards family farm sailing along. Matt, who also has a lawn care business, does most of the harvesting, while Richard takes care of the day–to–day care. "Agriculture is in our blood," Matt said. "It’s something we’ve always done. I love it because he loves it so much and I’m able to help him do this." Pennell Barn is located in York, SC. More info coming soon!